Uplifting Love: Thank You Ashton! As many of you have noticed Uplifting Love received a "face lift" a couple of weeks ago. I am grateful for talented people who have helped me learn more about blogging. I am especially grateful to Ashton @ www.somethingswanky.com for her help with the redesign. It is her idea and she deserves all of the credit. Please drop by and visit her site (www.somethingswanky.com). It's a great dessert site with lots of great recipes and ideas. You'll love it! 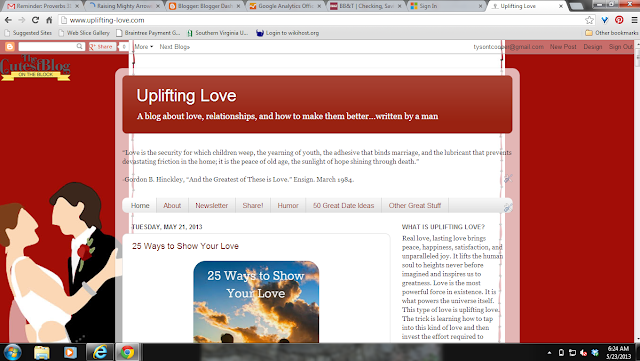 For those of you that are new to Uplifting Love here's a screenshot of what the site used to look like. I liked it (it was a big improvement on the first design with clouds and things in the background; I really didn't know what I was doing then) but this is MUCH better. Thanks again Ashton for your help. It looks great!